From the cooperation with Orlandini Design arises the project Q.5 which opens the new era for contract and residential environment. The sign of simplicity, the pleasure of smooth shape, handless and innovation given by Q.5 design. Thanks to its simple design, versatility and employed materials Q.5 is an example of intelligence in the design as well researched style. Q.5 can be easily located indoor and outdoor and able to satisfy in a simple way the necessity for community, office, waiting area, bar and restaurant. Q.5 is the right solution for indoor and outdoor environments. Q.5 is made of a polypropylene shell available in 6 different colours: pearl white, moss grey, green, black brown, taupe, sky blue and the new white fireproof. The chromed rod structure allows the stacking up to 5 pieces, making it easy to use and to store. The version with a round and upholstered Pad, aesthetically significant, which can be fixed to the seat is useful to better the comfort of the seat. Coloured and lively, Q.5 with 4 chromed legs can be easily located inside all kind of furnishing. Multipurpose chair: at home, bar, office, hotel, in-outdoor use. Strong, stackable, light and customize Q.5, by matching all the available colours for the shell together with the structures (white or black painted and chromed) is full of versatility, functionality and design. 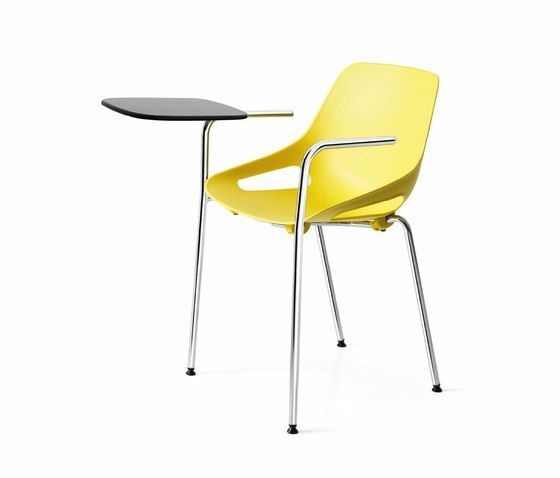 Q.5 chairs enclose inside its simple and soft shell, high technical contents. The polypropylene shell conceived to follow to and support the body in a correct and ergonomic way and thanks to the various and available structures, becomes a perfect complement of furniture. The use of specific accessories, as metal hook and writing table make solutions adaptable for the conference, meeting, university and all community areas. Q.5, versatile and light, find a specific and original characterization with the wooden legs structure. The plastic shell meets the brightness of the oak wooden legs in natural or Moka finishes and make it an object of design with a high aesthetical value. The welcoming shell and compact shell make Q.5 a comfortable seat but at the same time practical for a daily use. Q.5 chairs suggested for bar, hotels and all modern community spaces, ensures functionality and customization. Q.5 completes its range by introducing the beam system. The shell is fixed to the beam (dim. 80x40) thanks to a solid metal frame that can be floor fixing or movable. The frame available in white painted or grey aluminum is proposed with 2, 3, 4, 5 seats and can also be equipped with a metal table. Strong and versatile, the polypropylene shell also enables to realize elegant stools with a rod chromed frame.